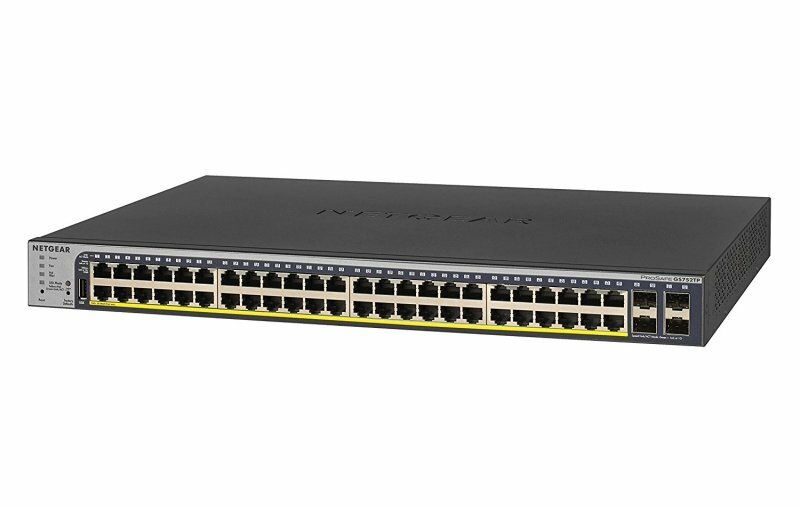 The NETGEAR® GS728TPv2, GS728TPPv2, GS752TPv2 and GS752TPP Gigabit Smart Managed Pro Switches come with 24 or 48 PoE+ copper ports and 4 dedicated SFP ports for fiber uplinks. Cautious spender organizations can now deploy denser PoE+ devices connected to a cost-effective switch, with a reasonable PoE power budget of 190W over 24-port, or 380W over 48-port. Organizations who buy infrastructure for the long term and want future proofing for the unforeseeable can now select a switch with a PoE power budget of 380W over 24-port, or 760W over 48-port providing more headroom. With temperature-based fan-speed control, the GS728TPv2, GS728TPPv2, GS752TPv2 and GS752TPP support quiet rack mounting with a maximum of 31dB, 35dB, 38dB and 43dB at 25°C (77°F) ambient, respectively. These Smart Managed Pro Switches offer an easy-to-use Web browser-based management GUI with configurable L2 network features like VLANs and PoE operation scheduling, allowing SMB customers to deploy PoE-based VoIP phones, IP cameras, video-over-IP endpoints and Wireless access points. Advanced features such as Layer 3 static routing including IPv6, DiffServ QoS, LACP link aggregation and Spanning Tree will satisfy even the most advanced small business networks. This latest generation of Smart Managed Pro switches features Energy Efficient Ethernet (IEEE 802.3az) for maximum power savings and is backed by NETGEAR's Lifetime Limited Warranty and 24/7 support including lifetime chat.